The animals in your house or attic are getting inside somehow. Every area of the house must be checked thoroughly, from ground level gaps, vents, soffit vents, eave gaps, plumbing stacks, chimneys and more. We know all of the areas that animals can and do use, and the telltale signs. Raccoons tend to rip open one large hole. Squirrels tend to chew. Rats and mice can enter very small holes, but the areas vary by species of rodent. 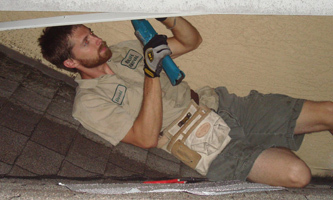 We seal up your house and make it completely 100% wildlife-proof. We perform our repairs with professional grade methods and steel, so that new animals can't chew their way in. This not only prevents future wildlife from entering, but certain jobs aren't even possible without repairs. The problems and property damage that can be caused by wildlife can be quite significant, and while sealing their entry holes can be one issue, the type of damage that they can cause once inside a property can be even more costly to repair. The most important thing to remember when it comes to repairing such damage is that you need to be sure to have dealt with the animal problem first, otherwise you are likely to be carrying out the same repair in a few months time. There are a range of different repairs that you may find yourself doing too, ranging from sealing holes in the attic or roof space through to replacing gnawed cables and replacing vents that have been damaged so that animals can get in and out of a property. When it comes to dealing with these kinds of holes, it is important to bear in mind that the points that are being repaired can be a problem for the future if they aren't repaired correctly to resist animal attention in the future. Depending on the size of the holes you may be able to use a filler type product, or for larger damage, you may need to replace a few of the bricks. Because the walls are such a vital part of the overall structure of a property, if you have any doubts or concerns, it may be worth hiring a professional to carry out the work. If you are repairing a hole that animals have been using to access a basement, you will also need to look at the exterior, and filling in any soil removed if you are dealing with a burrowing animal. The animals that get into the roof are usually fairly small, such as bats or squirrels, which mean that the holes to be repaired are also fairly small, but if you have larger animals such as raccoons present you may need a little more material to deal with the larger holes. If you are dealing with a vent, one of the best tips is not only to replace the vent, but also to cover the vent in wire mesh which will help to reduce the chances of the animals coming back again. It is also very important to search both the inside and the outside of the roof area thoroughly to see if you can find any other entry holes, as most animals prefer to have several potential escape points if they need to get out. One of the most important thing with this kind of repair is that it needs to make sure that it continues support the building's structure, and if there is serious damage then it may be worth hiring a professional. When it comes to small holes in plasterboard walls, these can be repaired either by using one of the metal backed patches, or in some larger cases you will need to cut out a small part of wall and then to replace it. Once the area is in place, make sure you apply a layer of drywall compound over the patched area of the wall, and then sand it before you paint over the area in order to help the newly repaired area to blend in with the rest of the wall. If you do have animals in the chimney, the most common part of the property that may have experienced damage will be the chimney top, if you have one, as this is usually the way that animals will access a chimney cavity. The best way to repair this is simply to have a new chimney cap installed, and depending on your property and the surrounding area, materials such as stainless steel often prove to be the toughest and most durable. It is also important to make sure that these are installed and that the joins with the masonry are well covered by the flashing, to make sure there aren't any gaps that could be exploited by inquisitive animals. Once you have carried out the repairs around the property, it is also worth considering if there are any steps that you can take to try and make your property less attractive to animals. Food is often a feature that attracts animals to your property, so try to make sure that any animal feed is kept in sealed containers inside, while it is also worth making sure that any garbage is stored indoors, preferably within a sturdy bin. Having carried out your repairs, make sure that you check the exterior of the property regularly, and if you have had a problem with animals getting into the roof, cutting back any overhanging trees can also be an useful step. Go back to the main How to Get Rid of Wild Animals page for more information about animal trapping and information about How To Repair Different Types Of Wildlife Damage And Entry Holes.